+ The sound is pretty decent. Good opening, good closing, and those moments of intense situations make you dread the "zawa zawa"
Our story begins with Kaiji, a heavy gambler who lives in poverty. He spends his days drinking, throwing away his money and collecting souvenirs from cars he cannot afford. One day, he is approached by a loan shark, who tells Kaiji that he owes ¥3,850,000 due to co-signing a loan with a former coworker that has disappeared. Kaiji is given the option to try to earn all the money quickly, by participating in an unknown gambling event on a ship called Espoir, which Kaiji agrees to. And thus begins the first arc. From there, we are introduced to the first game – Restricted Rock Paper Scissors. The rules were outlined after the issuing of war funds, which were done a minimum of 1,000,000¥ and 10,000,000¥. The money was in effect a loan, equaling the debt of the contestant and compounded at 1.5% every ten minutes for the four-hour voyage; contestants who hold onto their funds for the length of the trip would have to pay 140% of what they invested, thus putting an incentive to finish games early. Money that exceeded the amount needed to repay the loan to the hosts would be pocketed by the contestant. Here we have a new rule – the hand gestures are represented by cards, and contestants are given four cards each with the same gesture for a total of twelve. Contestants are also given three plastic stars as collateral to bet on each round of play – whenever one loses a round, the winner gets a star from the loser. To survive the night, contestants must maintain their three star pendants and lose all of their gesture cards. Cards cannot be destroyed or thrown away, to do so is subject to instant disqualification. This is vital to remember. When I was recommended this anime, I was told only one thing – It’s like if Yu-Gi-Oh! Season Zero involved the mafia instead of school bullies. You know, before it became a show just centred on a children’s trading card game. Also, remember how Season Zero was way, way darker. Keep that in mind. Kaiji indeed reminded me of the old gaming anime, but you can’t shake the feeling that the house will ultimately come out on top, driving Kaiji to darker places as we continue to explore this playground of lives these mobsters have created. The money leant for the games comes with a steep interest rate, and at the pace of this card game you can’t help shake the suspicion that although Kaiji will come out of this successful he will end up with an even larger debt than before. And this leads me to one of arguably the shows biggest problems – the pacing. Now, on the one hand, creating an arc about a game which is intentionally meant to be played quickly makes you wonder just how they will spread it out to make the time pass. As it happens, this is not unusual. I remember duels in the Yu-Gi-Oh! anime which went on for several episodes (it’s a trope all anime can fall into…don’t get me started on how long it took them to take down Frieza in Dragonball Z). However, this time gives us an opportunity to look at the characters – as Kaiji bands together with fellow damned souls – as they try to make the best out of a bad situation. To be honest, I can’t tell if it’s a good thing or a bad thing. The game drags on because that is how it feels to the characters – they cannot make the time pass any quicker, and as they slowly run out of options they are forced to strategise with what time they have and what hope eveyone else has. As a character, you know that this series will follow Kaiji as he attempts to clear his debt. As a main character, hestands pretty strong. He starts off naive, being played for a fool by a veteran and left in close to the worst possible scenario. He has no real talent, no secret power – just logic and his experience at the gambling table. However, as for a supporting cast, you are only introduced to ‘familiar faces’ late in the second episode – his teammates Andou and Furuhata, as well as the treacherous Funai. Everyone else is just ‘bait’ or uninterested our protagonist. Which is kind of bad, if it weren’t for the fact that in this situation…backstory doesn’t really matter. They’re all in debt, they’re all in the same pit of despair, and they have to find a way out before time runs out and the rules deem them losers. In a way, this series reminds me not only of Yu-Gi-Oh! Season Zero, but also a manga called Liar Game. 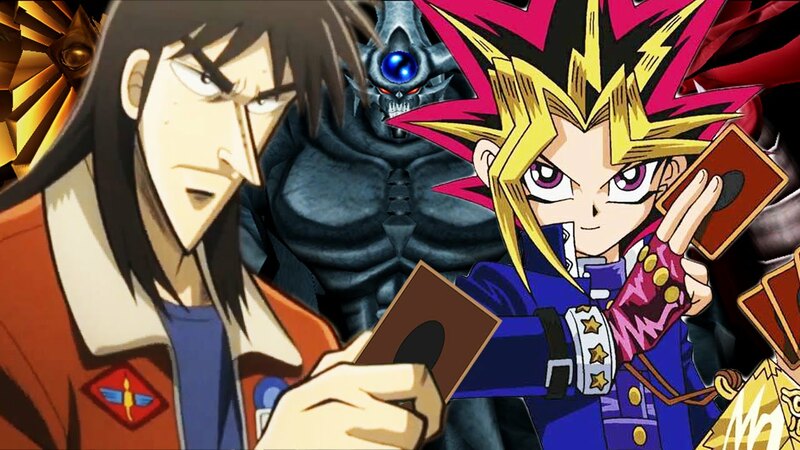 Characters with debts enter a game to clear their debts, are leant more money by the game organisers, have to deal with returning players…however, whilst that series featured a gaming genius as a sidekick, Kaiji only has…well, Kaiji. There is no genius, only those with the wit to stay afloat. Additionally, it is worth noting that one of the greatest assets of the series actually lies in the sound. Not only does Kaiji have a pretty decent opening and closing theme tune, but it also has a fantastic soundtrack perfect for the tense situations. One of the archetypes of the series is it’s signature use of an echoing ‘Zawa Zawa’ whenever Kaiji feels the hand of despair creep up to take ahold of him. It’s a sound that makes you know exactly how tense the situation is, manafesting onscreen as kanji floating along. It’s certainly chilling, in all the right ways. Overall then, should you be watching Kaiji? Whilst the pacing seems a little off, I get the feeling that this arc will ultimately come down to the wire. I like this, and the atmosphere around this anime really draws me in. I love the main character, despire the fact he makes huge mistakes in the first couple minutes of the game which has him scrambling at the bottom of the ladder. I’d say the only real downside is that honestly, the lack of an emphasis on Kaiji’s partners makes me wary of how they will grow (or how long they’ll last). Regardless, this has me hooked to the very last ‘Zawa Zawa’. Naruto Shippuden: The Board Game, Now in English!